According to the U.S. Travel Association, “direct spending on business travel by domestic and international travelers, including expenditures on meetings, events and incentive programs, totaled $259 billion in 2012.” And for every dollar spent in business travel, Oxford Economics has posed that businesses benefit from an average of $12.50 in increased revenue and $3.80 in new profits. So, packing a suitcase and hitting the proverbial road seems to provide a tangible return on investment, but the question is more about time management rather than reviewing the current model of return. First, consider the time involved with just getting to the airport. Travel plans must be made, bags must be packed, and then you get the always pleasurable experience of airport security; not to mention the multi-hour flight and the joy of navigating an unfamiliar city; remember as a kid when business travel seemed glamorous, me too, but not so much anymore. Now, think about how many more deals you could close, how many more local networking events you could attend, in the amount of time wasted just traveling from Point A to Point B. Now is the time to use YOUR TIME more wisely! Today, more and more businesses are replacing airline miles with videoconferencing as their primary means of client and staff communication. 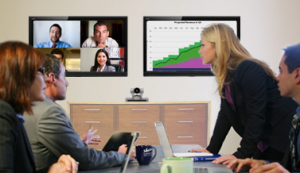 As a whole, some experts estimate videoconferencing could save up to $19 Billion annually. Now is the time to integrate videoconferencing into your business and Trinity can show you how. Trinity Video Communications provides a wide variety of video communication options ranging from traditional systems to affordable software-based systems hosted at your facility or in the cloud. Trinity is a full-service Audiovideo Integrator headquartered in Louisville, Kentucky. Trinity’s federal office is located near Dulles airport in Sterling, Virginia. Contact a Trinity representative today at 800-261-9008 to learn how your business can save big with videoconferencing.